Forever Marilyn... Personal plated collection Issued by the Bradford Exchange in 1997. 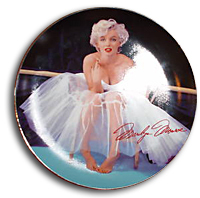 It is that first issue in the Marilyn by Milton H. Greene "Up Close and Personal" plate collection and bares Marilyns signature. Bradford Exchange COA and Number. "The Ballerina" Photgraphed by Milton Green.